Living on a dairy farm with her Farmer, four sons, daughters-in-law, wigglies, BEBs and all that goes with farm life has given Diane the unique ability to see one of God's biggest blessings. The Ordinary. Day by day the Ordinary passes without a glance from us. 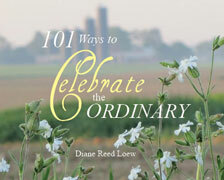 This book will help you unlock the treasures of the Ordinary in your life.